With a peak hubmotor electrical efficiency (ratio of output power at the road to battery power consumed) of 75%, our motor ranks amongst the most efficient motors available for e-bikes. Moreover we have “tuned” the motor to provide high efficiency and highest assist when the rider most needs it (hill climbing, headwinds…times of lower speed). 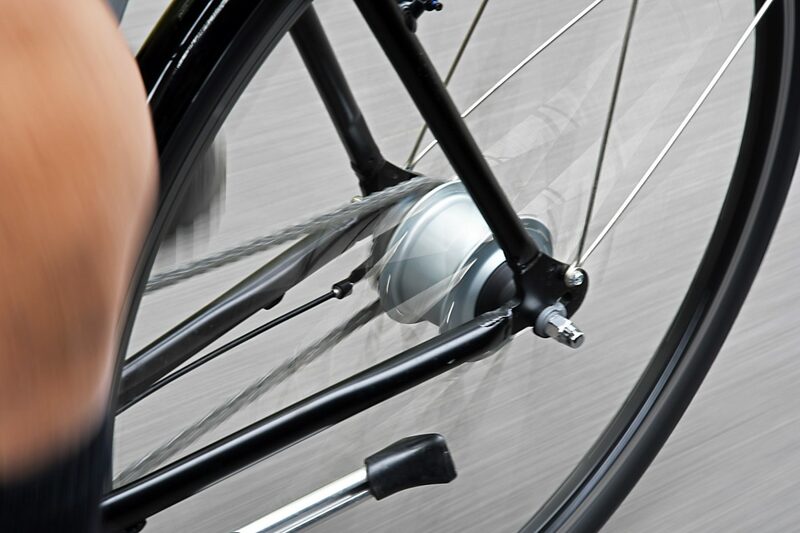 Most bicycles, ours included, transmit the rider’s leg power to the road through a “roller chain” drive system. In its simplest form (a chain and 2 sprockets all in line) a well-lubricated drive of this type can achieve a mechanical efficiency of 98% (ratio of output power to input power). When a variable drive ratio is required (as in a multi-speed bike) either the chain is required to run misaligned relative to the plane of the sprockets (derailleur-type gearing) or changes in speed are achieved by introducing a separate gear train (internally-geared hubs, see discussion in article “Available Gear Types”). The net effect is a drop in efficiency to somewhat below that 98% value. In dynamometer tests, how do the measured mechanical efficiencies of these two systems (derailleur vs internally-geared hubs) compare? In a well-tuned bicycle derailleur system, mechanical efficiency depends on which “speed” is selected (i.e., which front & rear sprocket combination), ranging from 90% to 95%. Typical internally geared hub efficiency is also dependent on which “speed” is selected and ranges from 80% to 95%. Shimano and several other manufacturers have now developed so-called “premium” internally geared hubs. Through the use of rolling element bearings and other low-friction techniques they have increased internal hub efficiencies to levels that rival those of a refined derailleur system. 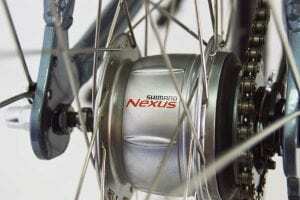 The Shimano Nexus 8 speed hubs that we use are of this type. For more of a discussion on drivetrains see the article “Available GearTypes…” in an earlier post.